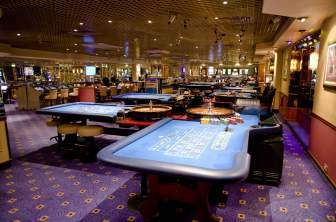 NB: Refurbishment in April 2015 will see a new restaurant and improvements to the gaming floor. The casino is closed on April 16th until 7pm for said refurb and while renovations are occuring, food will still be served in the bar area. Actually, there are also some superb restuarants nearby too including the Bombay Brasserie, probably my favourite Indian restauraint in London. Situated in the Millennium Hotel, just three minutes walk from the Gloucester Road tube station, this modern casino is a far cry from the Gentleman's club style of many of the 5 star casinos in London. Grosvenor Casinos want you to have a fun night out until the early hours. The restaurant offers a large choice of traditional dishes and there's a selection of snacks at the bar. These areas also have the latest sports on the (small) LED wall-mounted screens around the casino and touch screen guides on how to play for novice gamblers. There's also live entertainment on selected nights. The games are spread around with over 70 electronic stations and table games including Roulette, Blackjack (with Royal Match and 21+3 side bet games), 3 Card Poker, Super Stud Poker, Punto Banco, Let it Ride and 20 slot machines from IGT and Admiral (including the latest Novoline machines with God Of Thunder, Lucky Ladys Charm, Spinning Stars etc). New members to the club are given a tour of the building and a complimentary drink as well as a £5 match play on the slots and a 2 for 1 offer for their next visit to the restaurant. Membership can be obtained at the door - remember to bring some photo ID.